One of the chief criticisms of cavernous, subterranean death metal is that it tends to blur into walls of aimless sound. There’s a tendency among bands of this oeuvre to assume that a lack of interesting song structure can be masked with noise, murky production, or ambience. 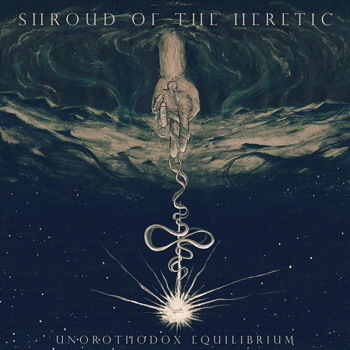 I’m happy to say that Shroud of the Heretic navigate around these pitfalls excellently, and create an abyssic death metal record that pull no punches while still making room for a few touches of ritualistic mysticism. Shroud of the Heretic’s last effort, Revelations in Alchemy was a less patient affair, though no less full of swirling blastbeats and cavernous production. This time around, however, the band moves in more measured steps, outlining each piece with a methodical precision that shows just how much they have improved from their debut. “Metempsychosis” opens with a spacious guitar line that hangs over the sparse drums, creating an aura of gloom that resolves into a terrific riff after building just enough tension. It’s an almost perfect introduction, and it brings to mind fellow Pacific Northwest gloom merchants Sempiternal Dusk and Anhedonist. I’ll be honest – I had to look up the term “metempsychosis” when writing this review. A cursory google search reveals that it describes a phenomenon rooting in Greek Orthodox mysticism in which a soul transmutes itself into a new body upon the old one’s death. In a way, this encapsulates Unorthodox Equilibrium perfectly. Each track retains the same aura as all the previous one while shifting slightly, and mutating into something more esoteric as it progresses. I feel that this record is one of the few death metal records this year that really conveys a feeling of true mysticism – a quality lost upon all but the best artists. Pedestrian subject matter makes no appearances here, and that’s all for the better. The best part about Unorthodox Equilibrium is that it’s so self-contained. It’s not too long, and it doesn’t overwhelm. Instead of rehashing the Impetuous Ritual formula, they inject just enough crushing doom to keep the subterranean chugs from taking too much precedence. The aforementioned “Metempsychosis” is a masterclass in managing tempo, mixing driving death metal charges with wrenching funeral doom and eerie plucked ambience. These bits and pieces crop up again in the title track, as well as during an impressively low-key segment in “Sprawling Black Mass Consummation”, where a subdued double-bass lurks underneath a menacing guitar that explodes into forward motion. Despite all the shifting of pace, nothing feels out of place, and each progression feels as if it was meant to be there. None of the interludes or heavier sections feel unwelcome. All of this attention to detail culminates in the excellent closing track “Omega Apeiron”, which surges through several minutes of blastbeat-ridden carnage before slowing the tempo and building up to a truly fantastic conclusion. The sense of dark purpose that pervades the entirety of Unorthodox Equilibrium comes to a head at the end of “Omega Apeiron” and it makes for a climax that emphasizes all of the band’s strong points. I mentioned earlier that Unorthodox Equilibrium feels self-contained. A more apt descriptor might be that the album is a singularity. It pushes and pulls, but ultimately it feels like a monument to decay, an undulating mass of unearthly sound that collapses ever so slowly inward upon itself. It’s an unsettling quality, but one that makes Unorthodox Equilibrium a wonderfully compelling death metal record.